"No inspiration is worthy until someone takes action to make it work." Dominant core organizational entities are divisions, which are aggregated into strategic business units. Divisions are defined as units having a clear set of customers and competitors. Divisions have profit and loss responsibility. They may be (a) organized as a stand-alone divisions that have effective control over every function required to compete; or (b) focused on a subset of tasks, such as development or → marketing. In the new era of → Systemic Innovation , innovation is not limited to new products and services. 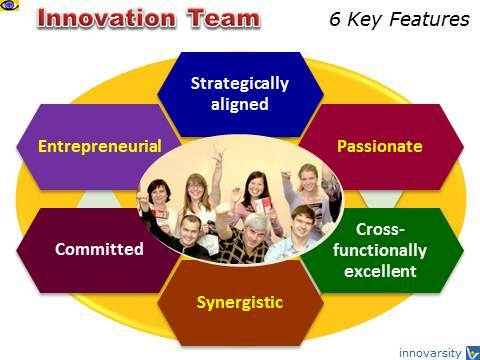 The organization structure itself is an integral part of the innovation process. Leading firms are constantly reorganizing to ensure that the organization conforms to the innovation and other task requirements, rather than the other way around. using cross-divisional councils as platform for defining new technologies and defining business strategy (Cirrus Logic). Most organization use multiple structural models to drive innovation efforts. In the new era of systemic innovation, it is more important for an organization to be cross-functionally excellent than functionally excellent. Firms which are successful in realizing the full returns from their technologies and innovations are able to match their technological developments with complementary expertise in other areas of their business, such as manufacturing, distribution, human resources, marketing, and customer relationships. To lead these expertise development efforts, cross-functional teams, either formal or informal, need to be formed. These teams can also find new businesses in white spaces between existing business units. When I hire somebody really → senior, the real issue for me is, Are they going to fall in love with Apple? Because if they fall in love with Apple, everything else will take care of itself. that sends positive "body language" to employees and visitors. In taking Dell private, we plan to go back to our roots, focusing on the entrepreneurial spirit that made Dell one of the fastest-growing and most successful companies in history.